Pacific bluefin tuna, southern bluefin tuna in the southern ocean south of 30oS, Atlantic bluefin tuna in the north Atlantic compose so-called temperate tunas. The three species are large tuna species, and especially Atlantic and Pacific bluefin tunas reach more than 3 m in length. They are long-lived (e.g. more than 40 years for southern bluefin tuna). The meat is bright red color and highly appreciated as “Toro” in Sushi. These tunas are caught by longline, purse seine, trolling and other various gears. The spawning by all these tunas takes place in the tropical and sub-tropical waters. 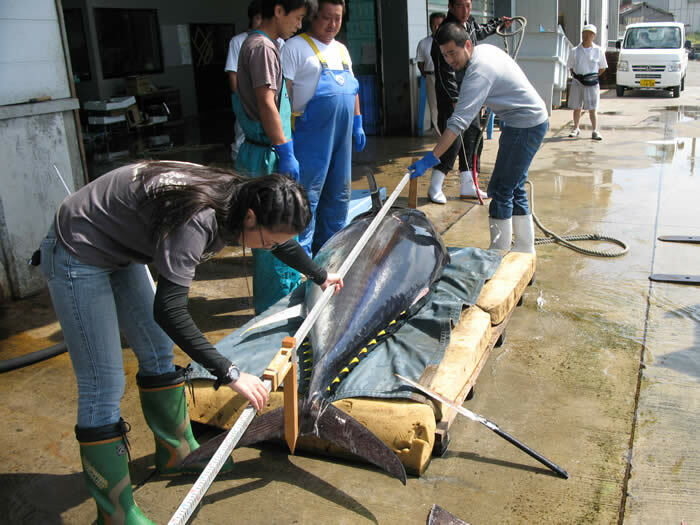 Large-scale migration is known to occur, such that young Pacific bluefin tuna conduct trans-Pacific migration from the waters around Japan to the near-shore of southern US and northern Mexico, spend several years and go back to the waters around Japan. In managing these stocks, compatible measures are necessary to be placed not only in the EEZs but also in the high seas. The responsibilities of this Division are, in cooperation with the Regional Fisheries Management Organizations, to monitor the stocks and to provide scientific advices in order to manage the stock at optimal level. In addition, we conduct ecological studies such as growth, maturity, spawning and migration as well as data collection and analyses for the national fisheries.